Backlinks are the main building blocks of Search Engine Optimization. Generating quality backlinks for your blog or website should be given the top priority while devising your SEO strategy. It is of utmost importance to keep track of backlinks associating with your website to avoid google penalties. Regular backlink audit and removal of toxic links will boost your domain authority and help maintain the search ranking positions of your website. 2 How to gauge the quality of backlinks? 3.1 What are toxic backlinks? 3.2 How to discover toxic backlinks? 3.3 How to remove toxic links? 3.4 How to disavow backlinks in Google Search Console? Backlink, also known as inbound link, is an external URL that is directed from another website towards your webpage. The number and quality of the backlinks indicate the popularity and trustworthiness of your website. In essence, backlinks are endorsement signals for search engines about the usefulness and quality of your content. Multiple high authority websites linking to your webpage or website tells search engines that the content is highly credible and therefore worth ranking on top of SERP. Acquiring these quality backlinks has the potency to increase the website’s search engine visibility and domain authority. How to gauge the quality of backlinks? Backlinks provide important ranking signal which influence the way search engines ranks the webpages. Google’s founders Larry Page and Sergey Brin developed a mathematical algorithm known as PageRank to measure the authority of a website. PageRank rated the website from a scale of 0 to 10 based on the quality and number of backlinks. Though google no longer reveals PageRank data to public, it continues to be the secret sauce of its evolved ranking algorithm. Fortunately, you can still determine the Page Authority and Domain Authority (nearly same as PageRank) of the websites linking back to you using tools such as MOZ Open Site Explorer and SEMrush Backlink Analytics. These tools enable you to quickly measure the quality of backlinks and perform spam check. SEMrush is the best tool when it comes to measuring the quality of backlink. 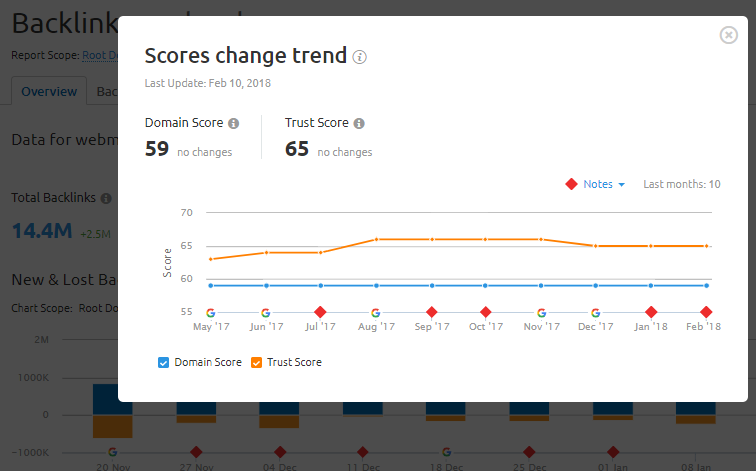 Apart from Domain Score (Similar to Domain Authority), it also displays the Domain Trust score. The Trust score is based on the number of backlinks from trusted websites pointing to the domain. The websites with high domain score and significantly low trust score indicates SEO malpractices that can potentially trigger Google penalty. You can’t afford to have low-quality and spammy links pointing at your website. A quick backlink analysis through SEMrush can save the day. Toxic backlinks are the spam or unnatural links that are violating Google webmaster guidelines. They can quickly ruin the SERP rankings of a website. Bad backlink profile can trigger the Google’s Penguin penalty. You don’t want to get into hot water with the search engines for linking to a bad apple. Link networks and link farms– These websites are deliberately created in order to artificially manipulate Google rankings. More than often they are paid links. How to discover toxic backlinks? The best tool to easily discover toxic backlinks is SEMrush Backlink Audit Tool. It allows you to monitor, analyze and remove the toxic links that are harmful for your website. There are over 50 different toxic markers used to determine the toxic score for a link. The ‘lost’ and ‘found’ feature of the tool makes it easy to keep a track of your backlink profile over time. Apart from backlinks you can also analyze the different types of anchor text associated with your backlink profile. By integrating SEMrush with Google Search Console, Google Analytics and Majestic you can manage all backlinks at one place. Once you have discovered all the toxic links, you should act immediately to clean up your backlink profile to avoid Google Penguin Penalty. The first option is to contact the website owners and request removal. However, in most cases the toxic links originate from shady websites with no contact information and you might have to reach them several times to get the links removed. It is best to document your link removal efforts so you can present it to Google in future if required. The second option is to disavow links using Google’s disavow tool. It tells Google to not take these toxic links into consideration when determining the ranking positions of your domain. You can directly disavow the toxic backlinks by integrating SEMrush with your Google Search Console account. Simply, click on the disavow option under Backlink Analysis and upload a disavow .txt file. 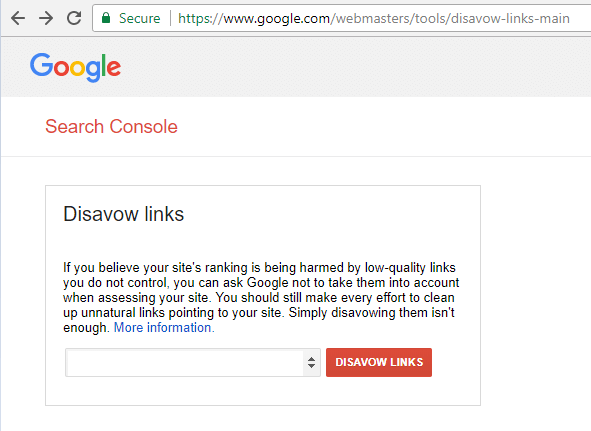 How to disavow backlinks in Google Search Console? It is always recommended to disavow links at domain level to ensure that Google ignores all bad links originating from that site in future as well. even on a domain level. To disavow toxic links, create an excel spreadsheet containing list of all toxic URLs. Next, you need to add “domain:” in front of each line. You can do this quickly by typing =”domain:”&A1 in column B. The disavow file must be in .txt format. To create a text file, you can use Notepad on Windows or TextEdit on a Mac. Log in to your Google Search Console. Go to disavow links tool page. Select your website property from drop down. Choose the .txt file you created. In future if you wish to update your disavow file, download the copy of your previous disavow file and add new domains to it. Update the new .txt file and upload it in search console. The new disavow file will replace the previous one. The backlinks to your site are highly valued if they come from websites that have content related to your webpages. The higher the relevancy of backlinks, the greater is their quality. For instance, if your website is about automobiles, you should try and get backlinks from a site about car racing or bike modifications rather than a website about gardening. Google penguin updates have rendered reciprocal links or link exchanges as bad SEO strategy. Backlink exchanges from irrelevant websites on the lines of ‘If you link to me, I’ll link back to you’ to manipulate search engine rankings can infact backfire. However, it is okay to cross-link your website to other relevant websites in moderation. For example, if you sell cars, there is no harm in cross linking to an automobile manufacturer website. The reciprocal links should be few and highly relevant from a user point of view. If you own multiple blogs or chain of ecommerce websites, you need to be careful about interlinking them on the same IP. Search engines consider backlinks from websites with same IP address as dubious. It is commonly known as backlink bombing. 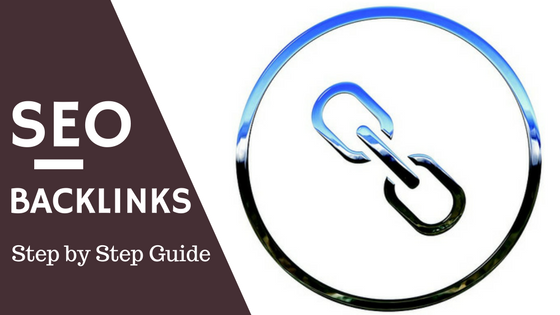 For sure, such backlinks aren’t going to help your SEO efforts, but a few links here and there are fine for the sake of providing extra information to the visitors. It is advisable to keep the backlinks from same IP address to a bare minimum. It is bad SEO practice to have the backlinks with same keywords in the anchor text. For example, if you have 20 backlinks and 15 of them uses the same keyword as anchor text, Google will quickly detect the pattern and penalize the website. Link Building Tool available in SEMrush project section can be used to manage link building contacts, track links in progress and monitor backlink profile. 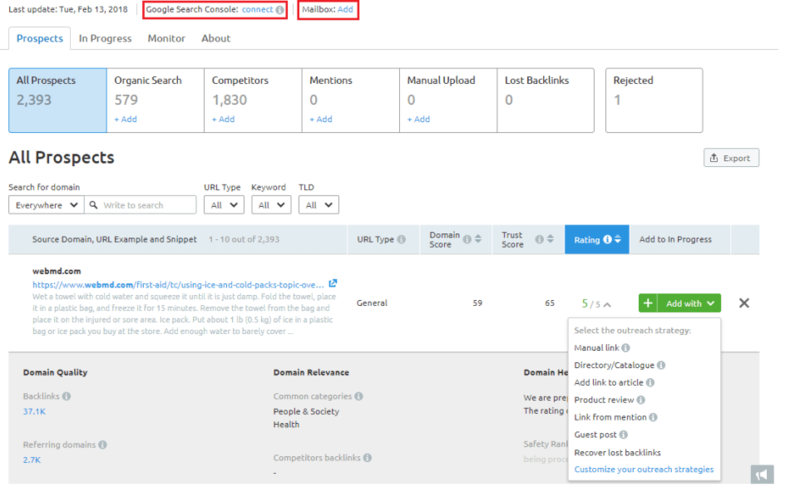 By connecting SEMrush to your Google Search Console account you can get further backlink access and automatically mark already acquired backlinks. The mailbox feature can be used to acquire new potential backlinks by reaching out to domain owners directly via emails. You can also target competitors and keywords to build a robust backlink profile and improve your search rankings. The Prospects tab gives important information about domain such as its quality, trust score, rating and relevance. Once you discover backlink opportunities in the Prospects tab, you can move the best prospects to your “In Progress” list to start acquiring backlinks. If you identify any lost or broken backlinks, you can move them back to “In Progress” list and take appropriate action to fix them. 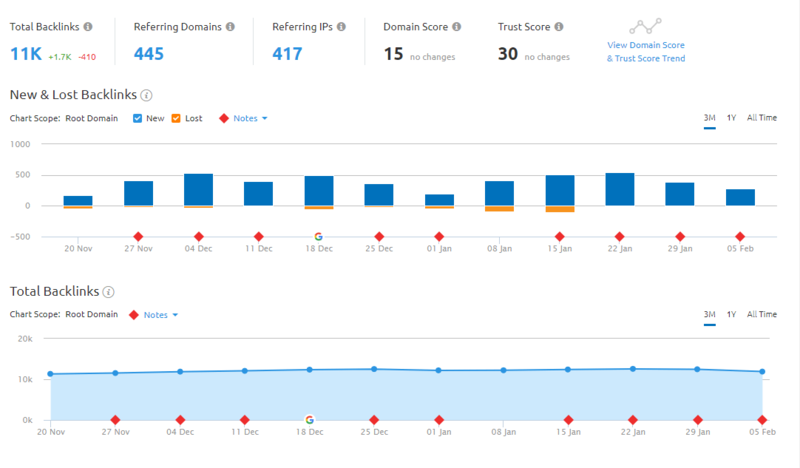 SEMrush Backlink Analytics tool helps you monitor your backlink profile. Using New and Lost Backlink chart you can track the number of backlinks acquired and lost over time. You can also compare your backlink profile with your competitor to find new backlink opportunities. If you want to dig deeper into your competitor’s backlinks, you must use Backlink Gap tool. You can compare upto to 5 competitor domains to analyze the overlapping backlinks. Backlink Gap is a great tool to leverage your competitor’s link building efforts to grab high quality backlinks for your own site.